From June 24-July 1, 16 professional educators from around the United States traveled Honduras with Heifer International to visit various projects. Check the blog over the next few weeks for more posts from Study Tour participants to hear their perspective on seeing Heifers work in the field. Learn more about Heifer's programs and resources for educators. 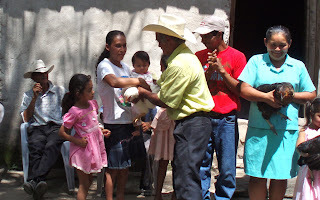 Let me begin with an admission: when I boarded my flight earlier in the summer for Honduras, I would have been hard pressed to fully communicate the meaning of one of Heifers core beliefs - the idea of Passing on the Gift. It is a testament to the power of Heifers Study Tours for Educators, however, that by the end of my time in Honduras, I could speak passionately on behalf of the organizations unique, values-based approach to the alleviation of hunger and poverty. Turns out, of course, that development is a complicated thing, and that its implementation differs from one community to the next. But if I were to distill my experience in Honduras to one moment, to one lasting vision of Passing on the Gift, it would focus on our visit to Mejocote, a rural Honduran village west of Tegucigalpa. 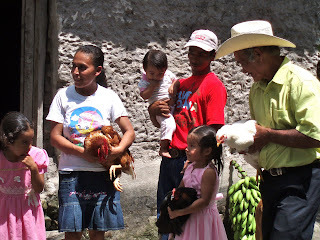 It was here that we witnessed the transfer - from one family to the next - of roosters and chickens. The transfer, though, was about so much more than animals. As the gift changed hands, we, a group of educators drawn from across the United States, observed development at its most local level: these chickens represented for the families involved the promise of improved economic prospects. And yet, in another way, the transfer embodied a number of the important goals to which Heifer, its partners, and its beneficiaries aspire: gender equality, local accountability, and environmental sustainability. The memory of those families - engaged as they were in such a small, but such a vital, act of self-improvement - has assumed an indelible quality in my mind. To my students in Washington, D.C., I will return in the fall with a renewed sensitivity to the importance of development initiatives built on local needs - and challenges. I will also return with a far better sense for the complexities of Honduran history and identity. Its thanks to Heifer and its exhaustive efforts on our behalf that I, too, am the recipient of a gift. This gift comes as a call to action: to develop new curricula; to orient my students, friends, and family to development initiatives in Central American nations like Honduras; and to support the efforts of those committed to a values-based approach to social and economic empowerment. In Honduras, where three out of four people in rural areas live below the poverty line, we have a unique opportunity to bring about lasting change. A generous donor will match your contributions up to $1.5 million, for a total of $3 million to help struggling communities in Honduras. We're close to reaching our goal, but we still need your help.